Create automated tests from your ALM Octane Gherkin tests, add them to an automation project, then run them in your CI server builds. Note: ALM Octane supports Cucumber-jvm 1.2.x only. Your IDE Add automation for the test, through a .feature file included in a JUnit Runner automation project. Ensure the Application Automation Tools Jenkins plugin is installed and configured on the CI server. For details, see Install and configure the ALM Octane CI plugin on your CI server. Ensure that your automation project is set up as a Cucumber project. To work with a Gherkin test in your IDE, you must create the test. In ALM Octane, if necessary create and add scenarios to your Gherkin test. For details, see Create Gherkin tests. In the Scripts tab of the test, click the Download script button. The script is downloaded as a .feature file. Note: ALM Octane uses the Test ID tag to map the automation results. DO NOT DELETE the Test ID tag! Add the .feature file to your automation project. To generate a Cucumber-based test results file that the CI server sends to ALM Octane, add the octane-cucumber-jvm library to your automation project and use the OctaneCucumber class as the test runner for your test classes. The octane-cucumber-jvm library is supported for use on Java environments only. In your Jenkins build job configuration, add a build step that runs the test. 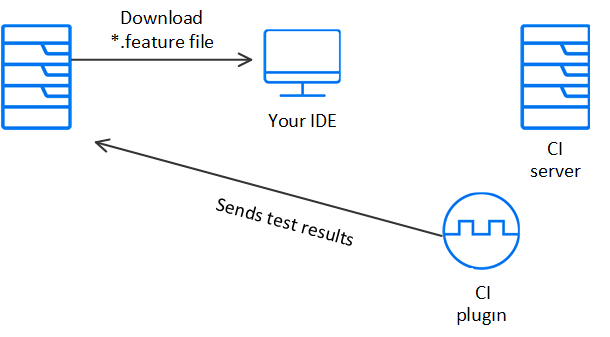 In the post-build actions section, add an HPE Octane Cucumber test reporter step. Note: If you add an HPE Octane Cucumber test reporter step, the CI server sends only the Gherkin test results to Octane. Test results from other automated tests are not sent as part of the build. The post-build action instructs Jenkins to copy the test results XML files from the path specified in the post-build actions to the Jenkins job build folder. From this build folder, the results are copied to ALM Octane. During the test run in the CI server, the OctaneCucumber runner generates a run results report called <test name>_OctaneGherkinResults.xml in a dedicated folder called gherkin_results. Note: If you are using the octane-cucumber-jvm library version 12.53.19 and earlier, the file name of the results is called OctaneGherkinResults.xml. If the post-build Cucumber test report step fails, the CI server fails the entire build. Ensure that your build project or build job that runs the test is included in an ALM Octane pipeline. When you run the pipeline, Jenkins generates the test results. The Application Automation Tools plugin reads the results file and sends the details to ALM Octane. For details on creating and working with pipelines, see Create and configure pipelines. To send the results to ALM Octane, you must run the corresponding pipeline. In ALM Octane or in the CI server, run the pipeline. If the test already exists in ALM Octane and the Test ID tag is included in the .feature file, ALM Octane does the mapping by the Test ID tag. If the Test ID tag is not included in the .feature file, ALM Octane does the mapping by the .feature script path. If the test does not exist in ALM Octane, the system creates a new test in ALM Octane and maps the results to it. Analyze the results in ALM Octane. This section contains troubleshooting suggestions for issues relating to running automated Gherkin tests. Check your code. Make sure that you are using right syntax: Cucumber does not always indicate syntax errors. Run your test locally. If you were able to run the test locally, check that an XML was generated. Check that your POM file is defined properly and includes the octane-cucumber-jvm library along with the correct version and make sure that OctaneCucumber is defined as the runner in your test class. For details, see Add the OctaneCucumber runner class to your automation project. If both POM file and test class have been updated properly and an XML is not generated, contact your ALM Octane support representative. If the test runs locally, check that the test ran in your CI tool. Make sure the Application Automation Tools Jenkins plugin is installed and configured on the CI server. For details, see Install and configure the ALM Octane CI plugin on your CI server. Check the server logs for errors. XSD validation errors are common. Check that the test script in the .feature file includes the test ID (TID) generated by ALM Octane. The test ID is required for mapping automation results. If the TID is missing, download the test script and implement it again.